When it was constructed in 1950, St. Eugene's Church was envisioned as a parish church in the growing Santa Rosa community. In 1962 the Holy See erected the Diocese of Santa Rosa, and designated St. Eugene's as the cathedral church. The cathedral parish boasts more than 1,800 families and seven masses a Sunday, including a traditional Latin Mass at 1:30 p.m.
St. Eugene's Cathedral, showing the nave and current sanctuary. Over the years as with the case of thousands of churches and cathedrals, the sanctuary was altered and "updated" to conform to the liturgical revisions and fashions. 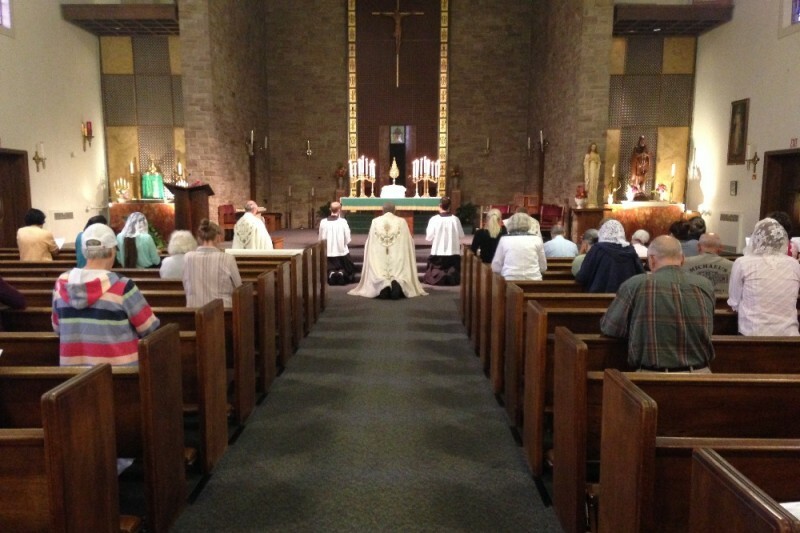 The Blessed Sacrament was moved to a side altar on the Gospel side of the church, and an altar installed that allowed Mass facing the congregation. Since he became Bishop of Santa Rosa in 2011, the Most Rev. Robert F. Vasa has sought to beautify the church and sanctuary under the guidance of the cathedral's rector, the Rev. Frank Epperson. A fund-raising effort was begun in 2013-14 to begin beautifying the church as sanctuary. A total of $500,000 must be raised. The effort has taken a major step with the decision to purchase and ship an altar and baldachino and altar rails that once stood in Ascension of Our Lord Church in Philadelphia. The church was scheduled for demolition, and Fr. Epperson was able to rescue the century-old pieces. The altar and Fr. Epperson. 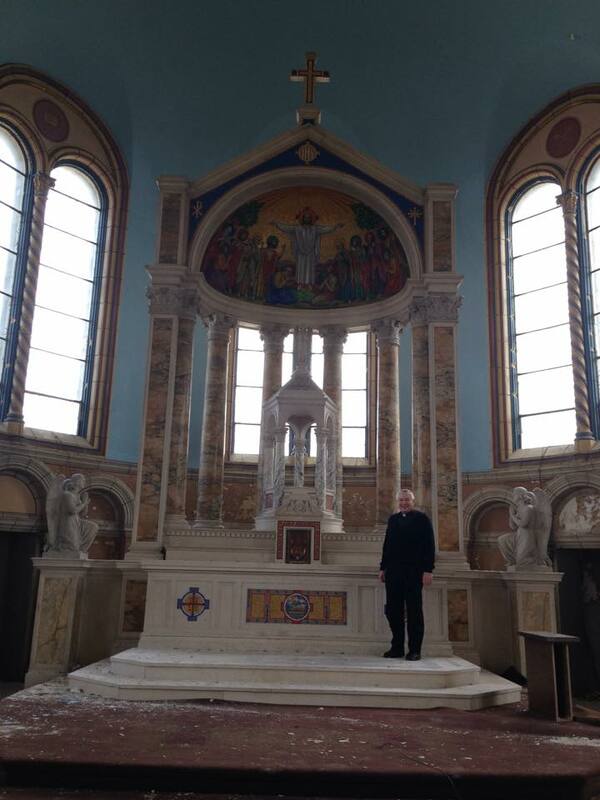 As the cathedral's Renovate St. Eugene's page indicates, the marble fixtures are "perfect for offering the Traditional Latin Mass -- which we have every Sunday -- in addition to the Ordinary Form. The altar and baldachino are of Carrara and Sienna marble." As with most altars of the period it is a large structure made of several hundred individual pieces. It was disassembled and shipped west, and is now awaiting reconstruction. As the renovation page explains, "The Church has been returning to such venerable practices as the use of Latin, chant and incense during Holy Mass. Establishing a sense of awe through such tangible means has also helped to restore a sense of the sacred within our church." With the eventual construction of a traditional-style altar and installation of chancel rails, the interior of the church's sacred space will be greatly enhanced. Those wishing to learn more, or looking to make a donation, should contact http://www.steugenes.com , or https://www.gofundme.com/mbnqv0 .